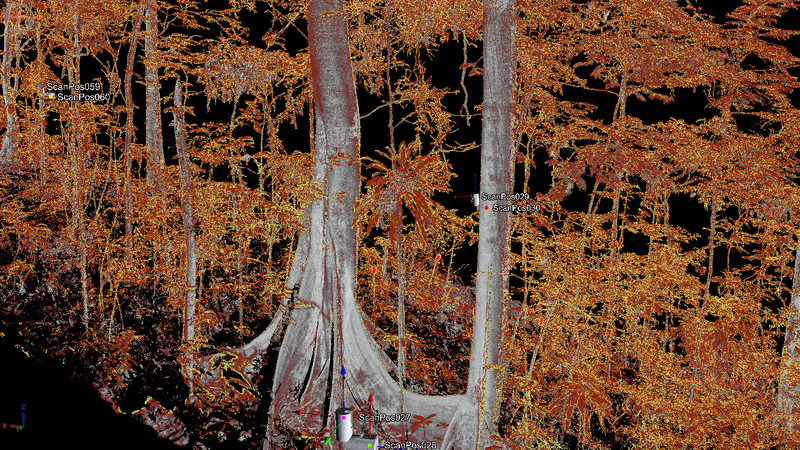 2 weeks, 2 hectares, 484 scans, many billion points, several hundred trees including way more 40+ m beauties than I've seen in one place before, some ants in the pants, some blood & definitely sweat, but fortunately no tears. Got some additional 'bonus' data to collect in the time left over with the ZEB, some high res scans of single trees but we got what we came for. We've acquired an additional member of the team for a few days in Melina, a stagiare with ANPN, who has already done some great work manually verifying which tree is which in the lidar stem maps. We're very happy about that and hope she can carry on with us in Lopé (if she wants to!). An example of one of these maps is here. 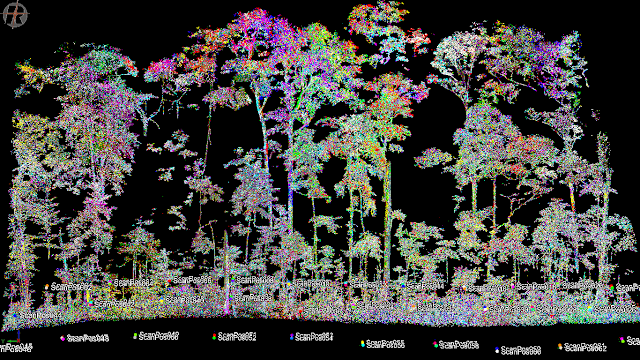 An example stem map, from plot MNG-04, showing the NE-most 20 x 20m quadrant, with tree sections from the lidar labelled with their tree IDs from the tags. Good work by Melina. And we really couldn't have done this without the huge help of Leandre, who has been amazing - guiding, carrying, organising, driving and generally being the oil in the wheels of progress. Thanks! Andy has been working through the Mondah data from the first two GEM plots, and here are some examples of what they look like. First up is a transect through the MNG-03 plot, which covers 1 full row of 100m, and is about 20m deep. The plot shows the scanner locations on the 10m grid along the bottom (3 rows of them). The colours represent points coming from different scanning locations, with each colour corresponding to the colour of the scan location 'dot' - it's quite hard to see those for any other than the nearest ones on the black background, but you get the idea. For example, the purple points in the upper part of the tall tree in the centre come from scans to the far left and right in this case, showing how scan locations far from a given tree can often reveal the most detail at the top, due to being able to see through the surrounding crowns more easily. Transect through MNG-03 showing the points from 3 rows of scan locations. There are 121 locations in each plot in total i.e. 11 rows of 11 locations, starting at 0, 0 and moving up to 100, 100 in 10m spacing. The point cloud here is drastically reduced (by factor of 1000) to allow easier manipulation. The image below shows a fill resolution example of a typical large tree with very grand buttressed roots, in the centre of the MNG-04 plot. In this case the colours represent the reflectance (returned energy) of the points, so the reflectance of points from the nearby broad trunk and roots is very high (near white), while the reflectance from the leaves and from points further away is much lower (orange through to dark red and black). Reflectance image of small section of MNG-04 plot. This shows the full point cloud density. Meanwhile, some more results from the ZEB-Revo scan are shown below. First, a height map of the whole plot, which shows the ZEB sees around 30m in some cases. So we can see the lower parts of the trees well, up to the crowns of the taller trees, but no detail in the upper part of the canopy. There are ~130M points in the 1ha cloud in total. Note that the heights aren't relative to the ground level but to the total height variation across the cloud. So the highest points (upper right) are still only 20-30m above the ground, but are on a raised area and so 30-40m above the lowest points. So the red parts here are largely a map of underlying topography. ZEB-Revo scan of MNG-04 plot, with the colour representing height, from 0 (blue) to around 35-40m (red). Another view of the ZEB scan of the plot, from above this time. View from above, looking down on the ZEB-Revo scan of the MNG-04 plot. And a zoom in on one section in the diagonal gap towards the left of the plot. This gap may not be real - I think it may be a function of my scanning pattern going haywire during my walk of the plot. Staying on the grid is hard when you're struggling to walk, not fall down the slope or large holes, trip over logs and vines and hold the scanner at the same time! Zoom in of small section of the ZEB scan of the MNG-04 plot. So we're back in Gabon, returning after 3 years to scan Yadvinder's GEM plots at Mondah where we previously scanned. And then on to Lopé where we'll revisit 2 previously scanned AfriTRON plots, and then a few more new ones established by Simon for the ESA BIOMASS cal/val campaign. This will be the first time we can look at possible changes over 3 years, against a backdrop of the recent very large El Niño event. 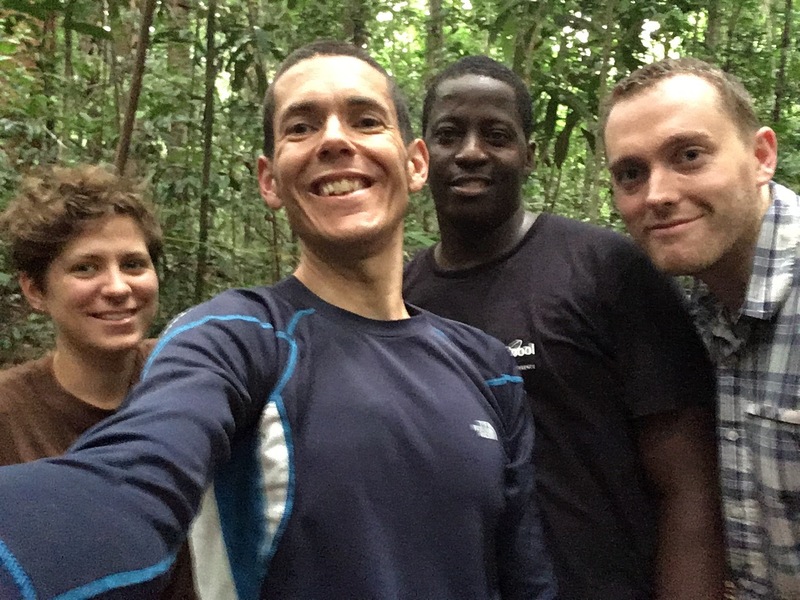 Andy is leading the field campaign, over 6 or 7 weeks, with Matheus, myself, Ewan and Joanna coming in and out over the duration. We've had huge help from ANPN Gabon, via Kath Jeffrey, Lee White, David Lehmann and others in organising permits, kit and logistics. Without them it's safe to say this wouldn't be happening. And they've also organised great local help, Leandre and Hector in particular, who are really helping to make the operation much more efficient. Day 1 and we had this visitor following us on the road! No you can't have my lunch. A 'typical' view of the second GEM plot. Leandre carrying the Riegl out of the plot. A job for a younger man than me these days! One of the giants we're here to scan, in the centre of our plot. Photos just don't do these trees justice - this one is 50+ m tall, with the enormous buttressed root system and a canopy that seems to be in the clouds. One thing we're doing here is testing out our new Geoslam ZEB-Revo handheld scanner, to see what it can do. In particular we want to see how well it can capture the tree trunks and diameter, given its relatively short range, and how quickly we can do plots. First results are very encouraging. I scanned our 1h plot in about 80 minutes, generating 500G of data, which took ~6 hrs to process. But Andy and I were surprised at the level of detail and how well the tree trunks were captured. The snapshots here don't really do the detail justice, but this looks very good indeed. It opens up the possibility of us covering many ha at this level of detail, for trunk diameter and shape, to augment the more detailed Riegl data. A very small slice through the 1ha ZEB scan of the plot. I also scanned a single large tree in the corner of the plot, looping around it 3 times. The results from this are also very encouraging indeed. Here's a slice showing the tree with 2 slightly smaller (but still huge!) trees next to it. The white points are a second horizontal slice through the cloud, shown in plan view below. Scan of single large tree (well, 3 really). A slice through the trunk of the large tree, at about 4m above the ground, with the other two smaller trees next to it, and the rest of the point cloud in gray around them. The larger tree diameter is around 1m.